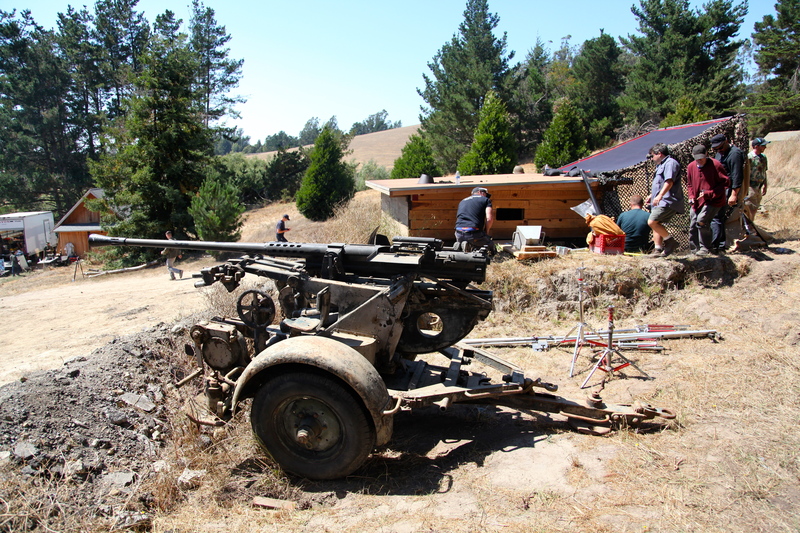 The movie shoot had all the usual marks of a Hollywood production: shouts of “action!” and “cut!” and a sound guy lumbering around with a bag of equipment strapped to his front. But it had one major difference; as soon as filming started, everyone but the actors needed to clear out of anywhere near the scene. The reason was a 360-degree camera debuted by Palo Alto startup Jaunt this past April. Step within view of one of the lenses ringing the camera’s body and you too will be in the footage, despite not being in the center of the action. The Jaunt camera. Photo by Signe Brewster. 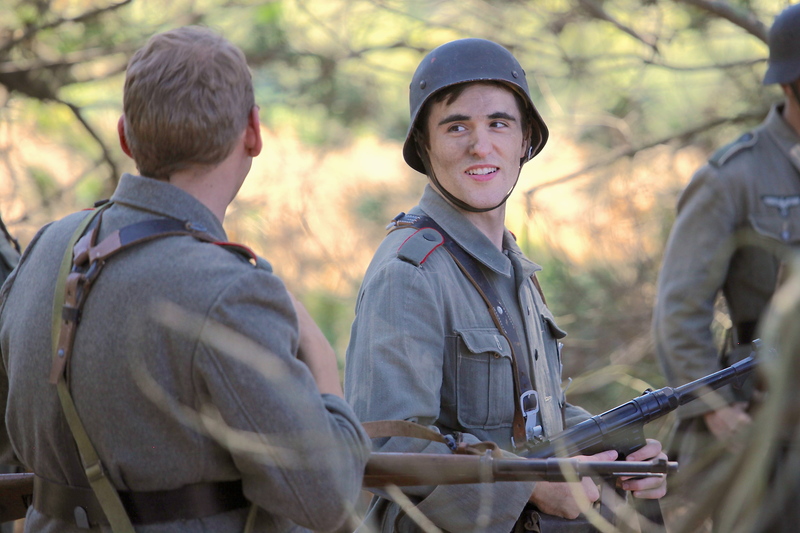 Actors wait between takes. Photo by Signe Brewster. 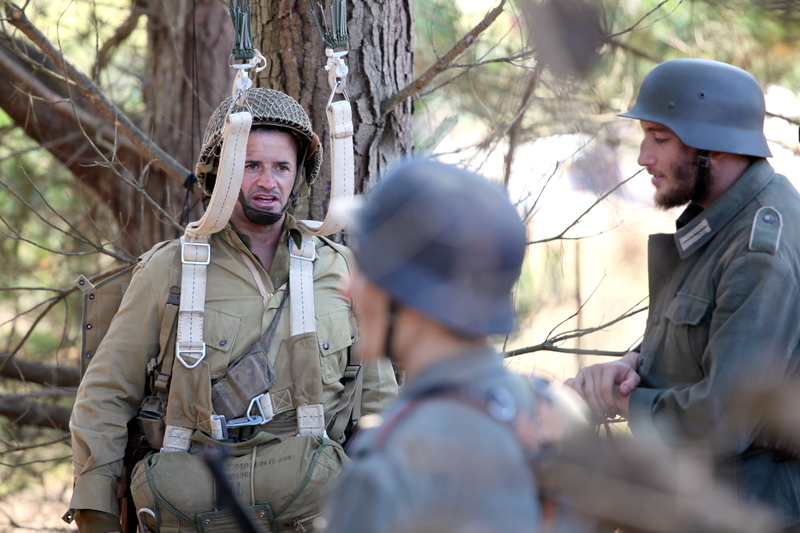 The film, called “The Mission,” follows the story of a World War II soldier who parachutes into Russia and is captured by German forces before being rescued. 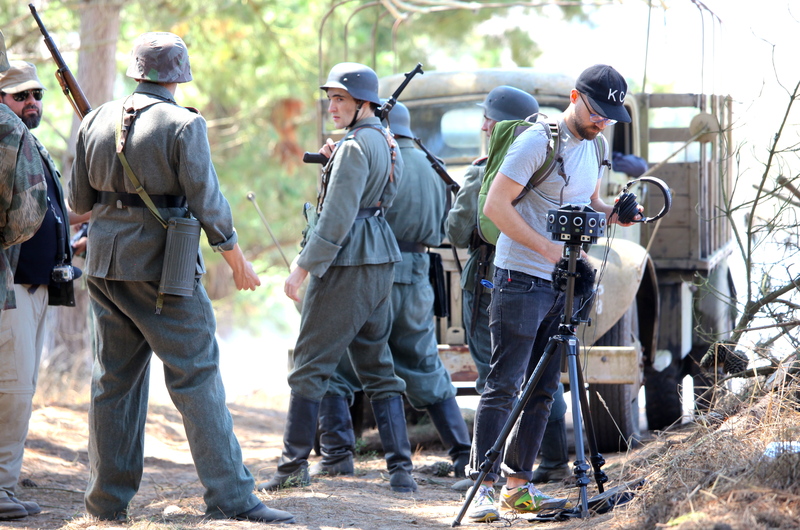 Avoiding the camera is just one of the challenges awaiting studios that choose to work in virtual reality, said Matt Gratzner, who directed the film for New Deal Studios this past weekend just outside of Petaluma, California. That requires creative equipment set ups too. Lighting and sound equipment need to be strategically placed outside the shot, just like people. One scene of “The Mission” took place in a dark bunker, where the crew rigged up giant mirrors and lights outside of cracks and small windows in the walls to direct a large amount of light inside. 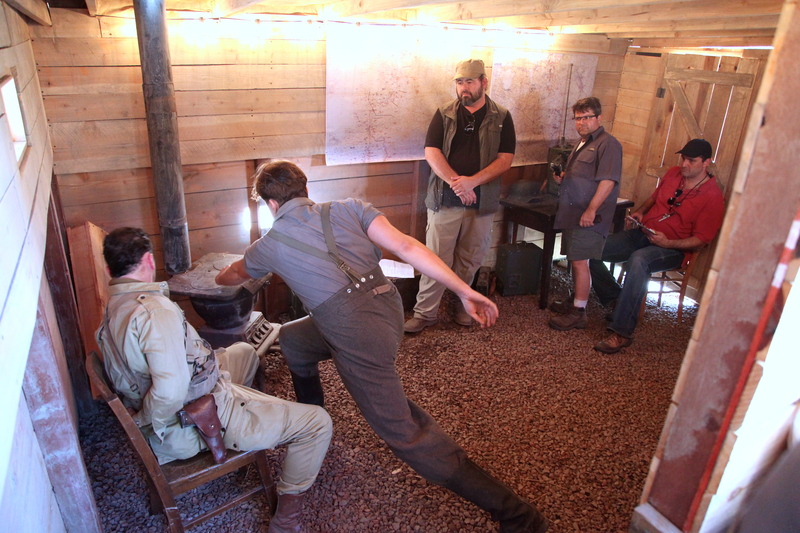 An actor pretends to hit his captive with a gun during a practice run-through in the bunker. Photo by Signe Brewster. The bunker. Photo by Signe Brewster. 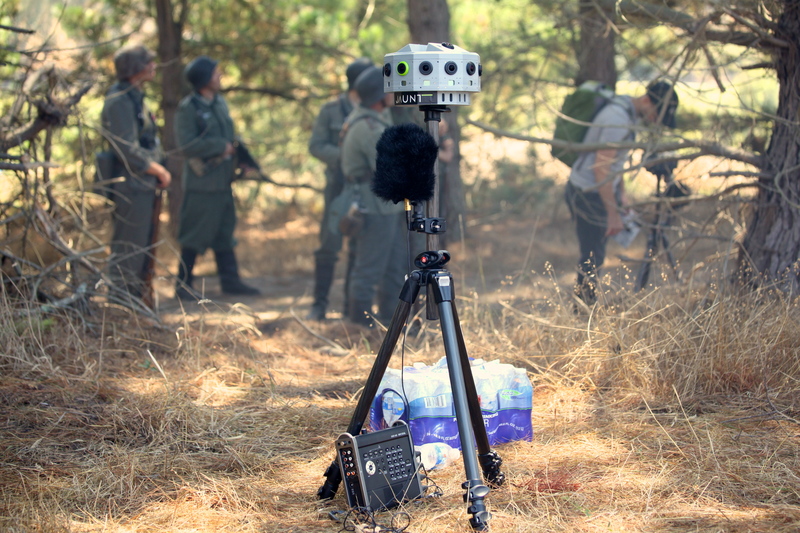 New Deal Studios has created virtual reality films in the past for partners like Disney, but the tools continue to change and improve. A firm release date for “The Mission” has not been set, but presumably it will coincide with Oculus Rift’s launch to consumers sometime in the next year. Wow! Can’t you imagine being able to walk around the movie you’re watching? To see a scene from multiple angles, or explore the geography of an area? Movies and video games seem inextricably tied from this moment on. What better a way to immerse your viewers than to use movie cinematics and actually 360 video-environmental development to lead people through not only a hollywood movie, but a blockbuster video game that is highly interactive. I’m wxcites about the possibilities but the problem seems to be that the director is going to have more trouble guiding the the audiences attention to the importance of a scene. It might work for action style films but not story/performance driven films. Since the audience/viewer would be an observer and not a character, why not have transition the view to an important scene and allow the viewer to walk around the scene but the POV revolves centered upon the key actors in the scene or alternatively they can choose to break away and they can walk around observing those characters who might be listening to the principle characters in the scene. People are able to listen to a dialogue piece an occasionally look at the principal characters while walking around a room. This sort of thing might happen more likely on a second viewing, where you might choose to focus on the extras who might be dreading what is being said to the group etc or to admire some of the set design that has a lot of detail. However for something like being able to get closer to the background you couldn’t have shallow depth of field unless the whole set and movie was converted to a digital set where there would be more options eg. fly above the action and maybe be able to jump to preset camera positions that the “directors cut” has. Also you could have small cameras on some extras that you the viewer could cycle between their POV at whim during action scenes making a viewing of the movie different every time. Take the movie “Black Hawk Down” as an example of multi-characters everywhere in different locations but in the same battle, and being able to jump between those characters as described above or the scenes. Perhaps choosing to view one group more than the others. There may have to be be more filming. But of course advancing the story and plot timing could still occur when its meant to be, its just the viewer can choose what they see in between the plot points of the movie. Using the same movie as an example, we had some scenes back at HQ with the man in charge of the operations etc, what if some audience want to spend more time viewing whats happening at HQ (on the third viewing) during the movies ‘action’ scenes, the important scenes where the plot moves forwards the audience is transitioned to that scene (eg. like when a badly wounded soldier is bleeding out etc). Again this idea would mean extended scenes or more footage in different locations like at the HQ. If the viewer wanted to focus on the commander then the movie would seem to be about him, whilst still diving into the battle scenes or perhaps some of the scenes are viewable on the monitors the commander is watching or via audio. Something like this would mean a viewer could watch the movie multiple times but “experience” it differently.